The Cultural Landscape of Civita di Bagnoregio is part of the Tentative list of Italy in order to qualify for inclusion in the World Heritage List. The site is accesible from town Bagnoregio in Lazio region and the first sight towards Civita is breathtaking. Civita is accesible for pedestrians only via one bridge with the fee of few Euros. The town of Civita is rather small and it is still diminishing due to the collapsing of tufa rocks, and there is almost nothing special inside the town. 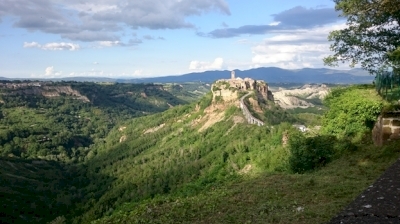 We also try to enter the valley around Civita, but it is not easy to access it and even to view it from other sites than from Bagnoregio because of bushes and collapsed side-roads.